was born at the colony of Forum-Julii, or Frejus in Provence, A. D. 40, in the reign of Caligula. 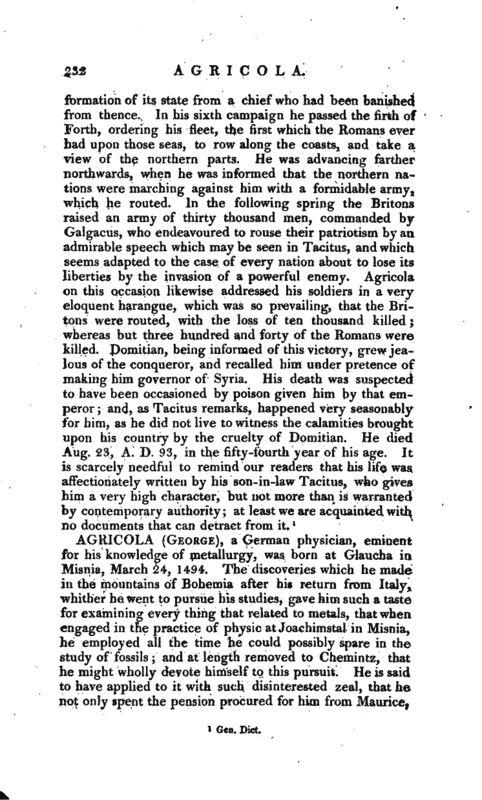 His father’s name was Julius Græcinus, a man of senatorian rank, and famous for his eloquence. He was put to death by Caligula for refusing to accuse Marcus Silanus. His mother’s name was Julia Procilla, a lady of exemplary virtue. 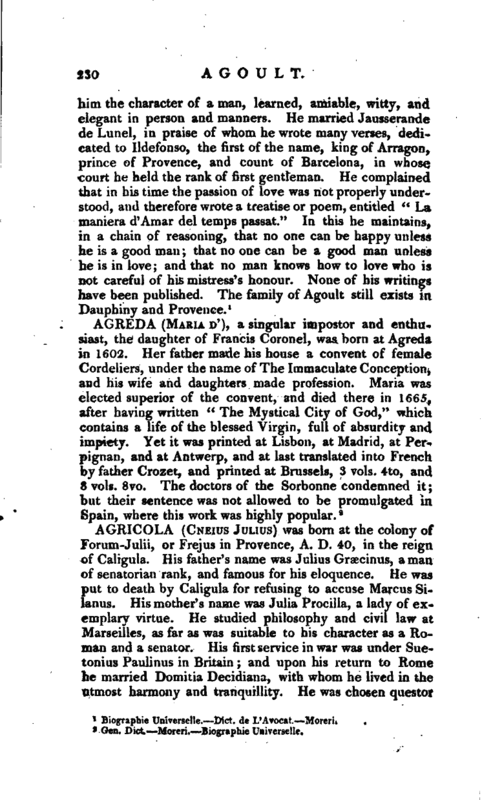 He studied philosophy and civil law at Marseilles, as far as was suitable to his character as a Roman and a senator. His first service in war was under Suetonius Paulinus in Britain; and upon his return to Rome he married Domitia Decidiana, with whom he lived in the utmost harmony and tranquillity. He was chosen questor: | in Asia at the same time that Salvius Titianus was pro-consul there; and he preserved his integrity, though that province was extremely rich, and Titianus, who was very avaricious, would have readily countenanced his extortions in order to screen his own. He was afterwards chosen tribune of the people, and then praetor, under the emperor Nero. 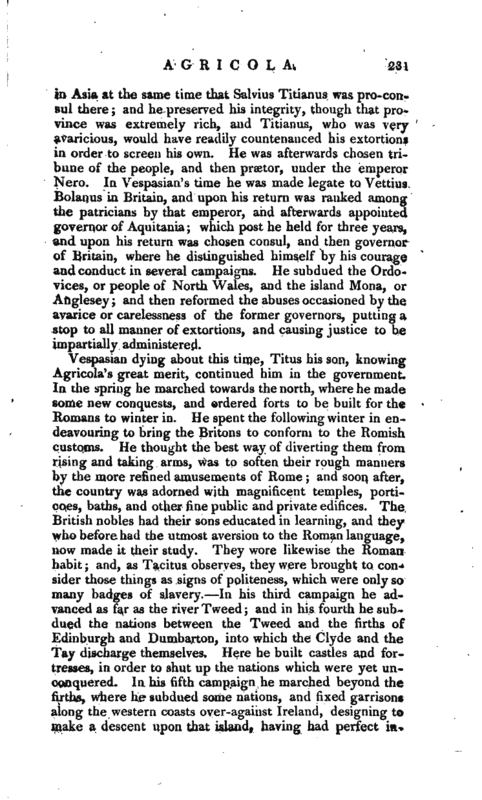 In Vespasian’s time he was made legate to Vettius Bolanus in Britain, and upon his return was ranked among the patricians by that emperor, and afterwards appointed governor of Aquitania; which post he held for three years, and upon his return was chosen consul, and then governor of Britain, where he distinguished himself by his courage and conduct in several campaigns. He subdued the Ordovices, or people of North Wales, and the island Mona, or Anglesey; and then reformed the abuses occasioned by the avarice or carelessness of the former governors, putting a stop to all manner of extortions, and causing justice to be impartially administered.